Life has been busy and it's awhile since I've had a chance to post, hopefully over holiday time I can update you all on some of all the exciting adventures and events of the past few months. This past week Christmas holidays started here and on Thursday I had just the best day catching up with friends and baking. Olivia is an amazing young lady I met this year when she hosted a fundraiser for Red Kite (Cancer support charity). At only 16, this young lady has already achieved so much and I love her passion for serving and helping others. Along with her sister Sophia, they are members of our local Hills Youth Army, volunteering to help at local events through our local council. When they asked if I would like to come over, spend the day baking the answer was a resounding yes. 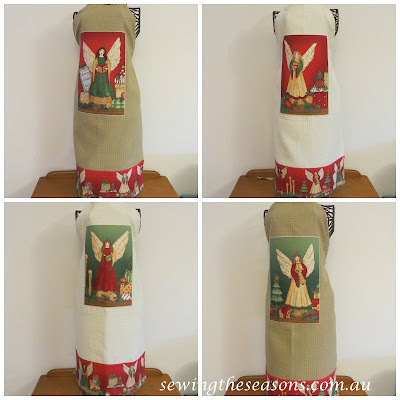 Of course, what Christmas baking day would be complete without Christmas aprons? So last weekend, I whipped up a set of aprons for the girls, their mum Julia and myself. Thursday was such fun, the aprons a huge hit and we achieved a lot. Two batches of cupcakes, some choc chip cookies, two trays of my chocolate fudge and some Oreo Balls later (oh and the additions of some antler ears) and we had finished. After a quick stop and rest for lunch, we finished our preparations and they plated up the goodies onto some trays. Olivia had wanted to do the baking to say thank you to our local Police, they are amazing group of men and women who she wanted to bless and I was happy to play a small part in the day. Here is Olivia handing over one of the trays to one of our local Inspectors. Such a simple idea, maybe it's something you might consider?